UPDATE: The Exchange originally scheduled for JAN 8th has been moved to Sunday, JAN 22nd due to icy weather conditions. Left to right: Amazing FCE volunteers Madison, Annie, Ginny and Jenny. Without the help of our wonderful volunteers the event couldn't go on. Thanks for all your hard work making the exchange as welcoming as it is fun and functional. As far we know, those green shorts are still available. We weren't sure how it was going to work. There were only three of us and we had the whole Fall Free Clothing Exchange to put on. We put out a call for volunteers, but didn't hear back from anyone. Now it was the just hours before our quarterly event and I'd be lying if I said I wasn't doubting how this was all going to come together. Then, an hour before the event, Madison said she be there. Then Annie showed up and Donna and then 4 more of our friendly exchangers arrived early, saying that they were here to help. All that time spent worrying and had I tacked on a single hour to my life? No. And despite my concerns was the Fall Free Clothing Exchange the best ever? Yes it was, and I'll tell you why. Back in September, the outstanding folks at Kenton Presbyterian Church, who give us a place to hold our exchange every quarter, did us one more by giving us space onsite to store the clothes for the exchange. This allowed your FCE team of volunteers to better plan and prepare for the fall event. Most notably it meant that setup and tear down are now a breeze compared to the previous logistical hoops. Now, instead of expending all our sweat on setup and tear down, we can focus on making your experience better and improving the quality of clothing items at the exchange. This is why we were so excited as the October exchange approached. We went right to work setting up the new FCE HQ - hand picking the best clothes and culling anything that didn't make the cut. 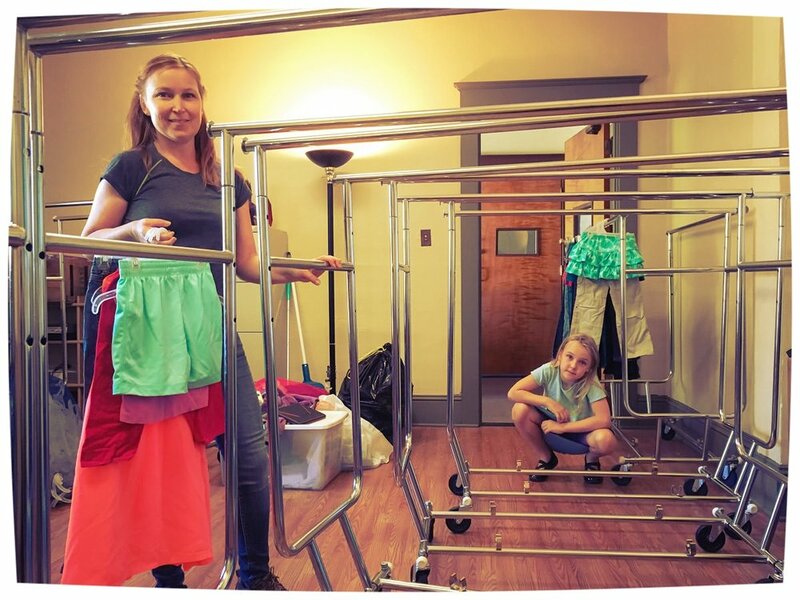 Our first day at FCE HQ: Jenny and Baya setup the racks and get to work sorting the clothes. As far we know, those green shorts are still available. Then October 2nd rolled around. It was go time. God had provided a storage space onsite and now volunteers were arriving just in the nick of time. It was a beautiful thing when new exchangers started arriving a half hour before the event started and we ready and waiting. No fuss. No muss. It was also deeply encouraging to see the exchange continue to grow. When we relaunched back in April, 24 households participated. This time around, by my very rough count, there were 37 households totaling 64 individuals happily buzzing around the basement at Kenton Church replenishing their wardrobes and connecting with fellow friendly exchangers. January is on the next page of the calendar now, which also means our first Free Clothing Exchange of 2017 is coming up soon…on the second Sunday of the new year in fact. We're asking all of our Friendly Exchangers to examine their wardrobes and look for extra winter clothing items that they can pass on to someone who may need them more. Any extra winter clothing, along with any new packages of socks, that are left over after the winter exchange will be donated to local shelters and Northwest Children's Outreach. The Fall exchange was amazing. Let's make this Winter's exchange spectacular. Mark your calendars for Sunday, January 22nd from 2-4pm (the rescheduled date!). If you plan on bringing clothes to exchange, start setting aside the clothes that you're proud to pass along. Tell your friends and family about the event and invite them along. If you'd like to volunteer, we'd love to have you on the FCE Team. The best way to get plugged in is to subscribe to the FCE mailing list and get in touch with us and let us know you'd like to volunteer. You can also just show up at an exchange, participate and then stick around and help sort clothes for as long as you'd like. From all of us at the Free Clothing Exchange, we wish you a peaceful, merry Christmas and hope to see you all in the new year at the winter exchange!